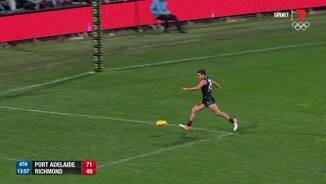 Did Westhoff mean this outrageous goal? 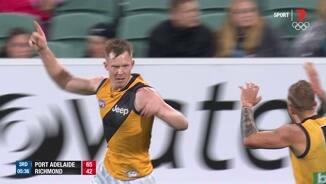 Jack Riewoldt has tried hard to the very end. He is up to a gamehigh seven score involvements and has contributed 31 points to his team's score. Aaron Young has now laid 10 tackles, a careerhigh. His previous high was seven against North Melbourne in round 3, 2015. Tigers InterchangeJayden Short off due to the blood rule. Aaron Young has laid five tackles this quarter, the same number as Richmond. Darcy ByrneJones has won nine intercept possessions, a career-high. He won eight in rounds 4 and 7 this season. Richmond has dominated field position this quarter and it leads the inside 50 count 71 but Port boots the first goal. Alex Rance has grabbed an equal gamehigh six marks, all from opposition kicks. Richmond is absorbing the Power attack. Port Adelaide has recorded eight of the last 10 inside 50s but failed to register a score from any of these. Alex Rance is up to a gamehigh 10 intercept possessions including five intercept marks. Rance has won nine intercept possessions per game this season, ranked #1 in the competition. 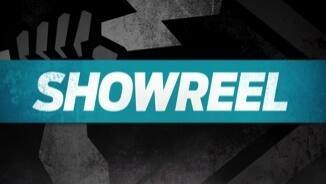 Power InterchangeJackson Trengove off due to an injury. Jack Riewoldt is up to six disposals and three marks this quarter as well as booting two goals. Nick Vlastuin is up to an equal gamehigh three intercept marks including two this quarter. There has been just nine stoppages this quarter after there was 39 in the second quarter. Richmond leads the clearance count 32 and it has generated two scores to none from this source. Jarman Impey lays his team's 14 tackle inside 50 which is one more than its season average. Tigers InterchangeShaun Grigg off due to an injury. The Tigers have generated the last five inside 50s and six of the last seven but they have just two behinds to show for these. The Tigers have already recorded four clanger kicks this quarter and they are up to 18 for the game, one more than their season average. Port Adelaide has recorded 11 disposals in the forward half this quarter while Richmond is yet to record one. Richmond has generated just two inside 50s from 22 chains originating in defensive 50. It has generated an inside 50 from 18 per cent of chains originating in defensive 50 this season, the thirdlowest percentage in the league. Matthew Broadbent won five disposals for the quarter with four of those winning a clearance for his team and two of those launching a goal. Broadbent also laid three tackles. Port Adelaide dominated the second quarter. It won the clearance count by seven, the contested possession count by 13, the inside 50 count by 14 and the tackle count by 15 on its way to winning the quarter by 29 points. The Tigers have won five of the last six clearances and they generated a score from two of these including that goal to Jayden Short. Port Adelaide has recorded 25 disposals in forward 50 this quarter. The Tigers have recorded just one disposal in this zone. Port have scored 31 points per game from clearances this season, ranked 12th. They have booted four goals from this source this quarter. Port Adelaide leads the inside 50 count 110 this quarter. Richmond is feeling Port's pressure. The Tigers have recorded just nine effective disposals this quarter while the Power have laid 13 tackles. 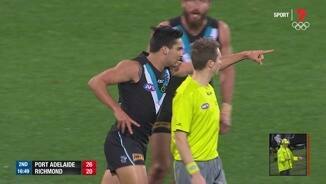 Port Adelaide lead the clearance count 51 this quarter and it has scored two goals from this source. Matthew Broadbent has won two clearances with both launching goals for his team. The Power has won two intercept possessions in the attacking midfield this quarter and they have booted a goal from both. The Tigers have recorded just one (ineffective) disposal this quarter while the Power have booted two goals. Both teams struggled by foot in the first quarter. The Tigers executed 31 effective kicks to the Power's 28, and they combined to record just two inside 50s from 23 chains originating in the defensive 50. The Tigers have recorded the last seven inside 50s but they have generated just two scores from these. Tigers InterchangeAlex Rance off due to an injury. The Tigers have booted two goals from intercepts in the attacking midfield. They have score 22 points per game from this source this season, ranked seventh. Tigers InterchangeDavid Astbury off due to an injury. The Power have booted both of their goals from intercepts in the attacking midfield. They have score 27 points per game from this source this season, the most of any side. Port Adelaide has laid 11 more tackles than the Tigers. The Power have laid eight more tackles per game than their opposition this season, the secondbest differential in the AFL. Richmond has retained possession from just three of Dustin Martin's nine disposals. The Tigers have won just 21 intercept possessions in the forward half per game this season, ranked 15th. Their first tonight launched their second goal. The Power may be leading the clearance count 51 but the Tigers have scored the only goal from this source. Port Adelaide has already won three intercept possessions in the forward half with their third launching the first goal of the game. The Power has won 26 intercept possessions in the forward half per game this season, the secondmost of any side. The Power have won the first four clearances of the game. They have averaged five fewer clearances per game than their opposition this season, the equal secondworst differential of any side. 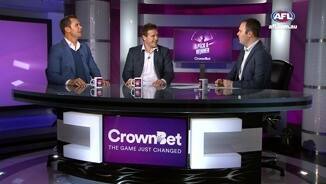 Jackson Trengove wins the first clearance of the game. He has won 43 clearances since round 7, the most of any Power player. Richmond has scored just one point per game from kickins this season, the least of any side and five points fewer than the Power. Port Adelaide has recorded 23 clanger kicks per game this season, the most of any side and six more than the Tigers. Welcome to Adelaide Oval for the Port Adelaide v Richmond Round 15 clash. 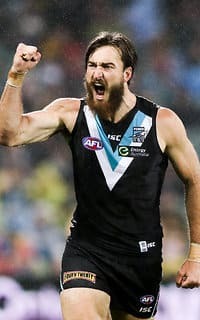 A BRILLIANT seven-goal second term has helped Port Adelaide keep its season alive, notching up a gutsy 38-point win over Richmond in tricky conditions at Adelaide Oval on Friday night, 14.10 (94) to 8.8 (56). The Power returned from their round 14 bye following back-to-back losses but, after a slow start, hunted the Tigers ruthlessly in the second term, winning inside 50s 20-6. The defeat was Richmond’s fifth from as many Friday night encounters this year. The victory leaves Port two wins from the eighth-placed Western Bulldogs. Power skipper Travis Boak (26 disposals, 11 tackles, two goals) was best afield, while Matthew Broadbent (two goals, four clearances), Ollie Wines (10 clearances) and Brad Ebert (eight clearances) were forces on the inside and Kane Mitchell (24 disposals, one goal) curbed the influence of Tigers captain Trent Cotchin (14 possessions). Anthony Miles (28 disposals, six clearances) did all he could for Richmond, as did Alex Rance and Jack Riewoldt (four goals). 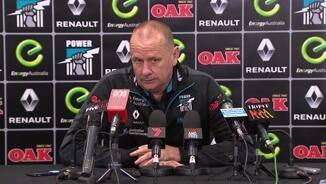 Power coach Ken Hinkley highlighted the club’s tackling pressure (106 tackles to 63) and specifically one laid by Robbie Gray, which he said started the second-quarter, seven-goal run. “It’s probably as good a quarter as we’ve played (in 2016), considering the conditions,” Hinkley said. “It started with Robbie Gray’s tackle I reckon. There was a tackle in the middle of the ground which was significant. Robbie gets a lot of credit for his outside stuff. It was that tackle on the inside that got us going. 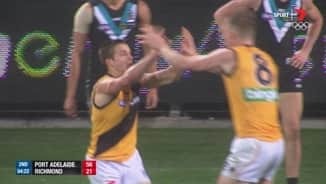 A stray boot flung by Justin Westhoff in a marking contest somehow delivered Port its first goal, but there was nothing lucky about Sam Lloyd’s two replies at the other end, pushing the Tigers to an early, albeit narrow lead. 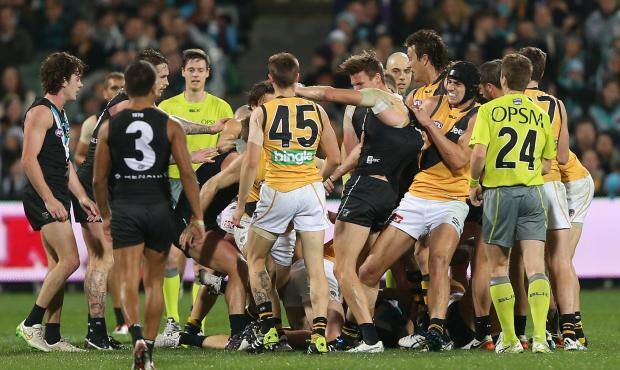 Cotchin didn’t take kindly to Mitchell’s close attention and the resulting physicality showcased just how much was on the line as the opening term drew to a close. The scuffle sparked the Power into a rampage; seven goals later the game was theirs to lose. Broadbent was sensational for Port on the inside, winning four clearances for the quarter - two of which resulted in goals. Heavy rain may have improved the value of each Power major but did nothing to take the heat out of the contest, with niggle between Mitchell and Cotchin again bubbling over before Martin and Ebert turned their backs on a nearby stoppage to lock horns. Down by 23 points at the main break on a saturated oval, Richmond required a monumental effort to pull itself back into the contest in the second half and Jack Riewoldt loomed a man capable of leading the Tigers out of the depths. His powerful left-foot snap breathed a little life into his side, but any hope of a comeback was cracked early in the final term when Chad Wingard slammed home his second from the goalsquare, and it was long shattered by the time Mitchell capped a terrific return to senior football by snapping truly from under Adelaide Oval’s historic scoreboard. 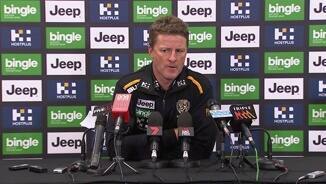 Tigers coach Damien Hardwick said his side was badly beaten at stoppages. “They out-hunted us and were more physical around the contest,” Hardwick said. Port Adelaide: Jack Hombsch was a late withdrawal from the side after injuring his quad in a final training session before Friday’s game. The club will have another look at him on Monday before determining how long he’ll be sidelined for. Richmond: No injuries for the Tigers, although there will surely be some sad and sorry players flying home. Both club’s face massive tests next week: Port will take on Hawthorn next Thursday night at Adelaide Oval and Richmond meet the eighth-placed Western Bulldogs. 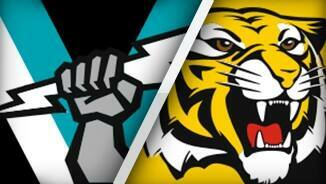 The Tigers are cooked but if the Power are to continue dreaming of finals they’ll have to cause a massive upset.